Judicial compensation has increased recently. All federal judges receive salaries and benefits that are set by Congress. Judicial salaries are roughly equal to salaries of Members of Congress. 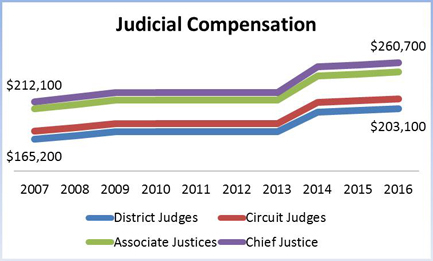 Explanation for the 2014 increase in judicial compensation. The pay for active and senior Federal judges increase from 2007 to 2016 is shown below. The 2014 salary levels reflect two separate adjustments. Beer v. United States, 696 F.3d 1174 (Fed. Cir. 2012), cert. denied, 133 S.Ct. 1997, held that the denial of certain cost-of-living adjustments for judges was an unconstitutional deprivation of judicial compensation in violation of the Compensation Clause and that a 2001 amendment that barred judges from receiving additional compensation except as Congress specifically authorized did not override the provisions of the Ethics Reform Act of 1989, Pub. L. No. 101-194. In an order filed on December 10, 2013, in Barker v. United States, No. 12-826 (Fed. Cl. filed Nov. 30, 2012), this holding was applied to other Article III judges, effective that date. As directed by these decisions, the salaries were reset to include the missed adjustments, resulting in the salaries of circuit judges set at $209,100, district judges at $197,100, the Chief Justice at $253,000 and the Associate Justices at $242,000. These salary levels were then further adjusted by the one percent cost-of-living adjustment provided to nearly all federal government employees and officials, in accordance with Executive Order No. 13655 (Dec. 23, 2013), effective January 1, 2014.